National Pension System – NPS – is a retirement planning scheme offered by Government Of India. Further to add, NPS is a voluntary contribution scheme designed to cultivate a savings habit in people and in turn secure their retirement life. The amount thus contributed is used to create a pension fund which is managed by Pension Fund Managers. Pension fund thus accumulated is later invested in annuity schemes designed by the Insurance company of your choice. Any individual whose age is between 18 years and 60 years as on date of joining of the scheme can join NPS. In fact, individuals can be either resident or Non-Resident Indians (NRI). Another key point is that in the case of government employees, your employer can also contribute towards your pension fund along with your investment. Two types of accounts are available in NPS – Tier 1 and Tier 2. Tier 1 account is mandatory for investing in NPS. Further to note employee, as well as the employer, can contribute to a Tier 1 NPS account. Contrary to this only owner of the account can contribute to tier 2 account. Earlier all the income tax benefits were available only for tier 1 account but with the latest proposed change, contributions by the government employees under tier 2 NPS also shall be considered under section 80C limit. One thing to remember is that there will be a lock-in period of 3 years for income tax rebate claiming. Transfer of funds Tier 1 to Tier 2 transfer in NOT allowed Transfer from Tier 2 to tier 1 is allowed at any time. As mentioned above, to sum up, anybody can open a tier 1 account whereas, only tier 1 account holders can open tier 2 account. All things considered, the tier 2 account is more or less a savings account. 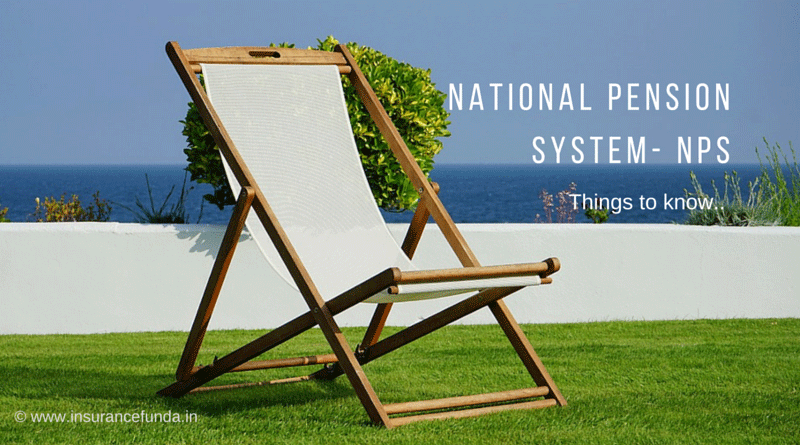 How to Join the National Pension System -NPS. You can join NPS either by Online or by Offline methods. Pension Fund Regulatory and Development Authority (PFRDA) has created an online portal eNPS to help people to join NPS through online method. However, in Offline method, NPS is distributed through authorized entities called Points of Presence (POP’s) and almost all the banks (both private and public sector) are enrolled to act as Point of Presence (POP) under NPS apart from several other financial institutions. You can find POP’s near you from here. The funds developed from the contributions are invested by the PFRDA registered Pension Fund Managers (PFM’s). And as of now, investors can select from following pension fund managers. Two different fund management schemes are available for investors to choose. View the info graphics given below to get an idea about the investment pattern of Auto Choice. If you cannot view the graph please refresh the page. Place the mouse over the graph to view the values. Employees can claim up to 10% of (Basic +DA) while self-employed can claim up to 10% of gross income under section 80CCD(1). This includes the maximum 1,50,000 benefit under section 80c. Employers contribution towards NPS can be claimed by employees up to 10% of (Basic +DA) or amount contributed by employer whichever is less. In fact the additional 50000 benefit available under section 80CCD(1B) is over and above 80C limit. With the latest changes introduced, the entire 60% of the corpus fund allowed for withdrawal is tax free. Further to add 40% of the fund which is converted into an annuity also will be exempt from income tax. But the annuity received will be taxed as in case of all other pensions based on the Income Tax slab of the individual for that particular year. Tier 2 Account holder can withdraw funds from his any time without any restrictions. Where as for tier 1 account holders, as he attains his retirement age, 40% of the accumulated fund has to be used to purchase a pension plan from an approved insurer. As of now, the remaining 60% can be withdrawn at his will. NPS pension calculator is an online solution to give you an idea of how much pension you can expect from your NPS contribution. Plan your contributions in such a way that you get sufficient pension when you retire. In the final analysis, the National Pension System has its advantages like income tax benefits for contributions, employer contribution etc. Now the government has allowed income tax exemption for the entire lump sum amount withdrawn at the time of maturity.